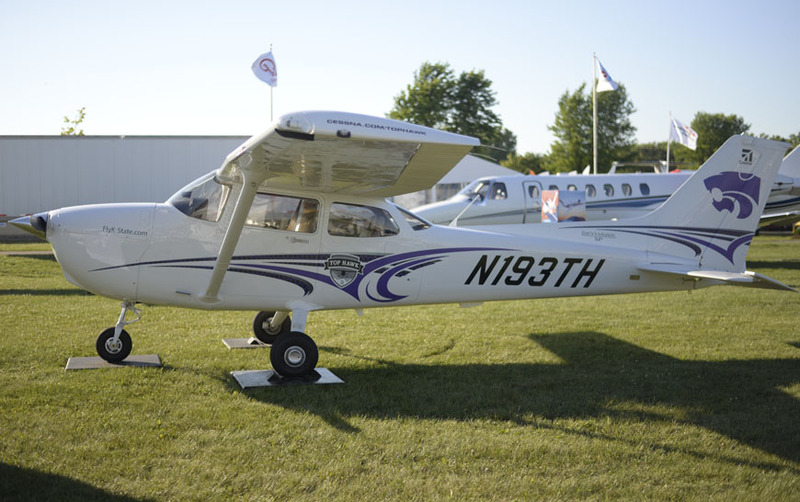 OSHKOSH, Wis., 2015-7-24 — /Travel PR News/ — Cessna Aircraft Company, a subsidiary of Textron Aviation Inc., a Textron Inc. (NYSE:TXT) company, today announced it is showcasing two of the Top Hawk-branded Cessna Skyhawk aircraft at the Experimental Aircraft Association (EAA) AirVenture this week in Oshkosh, Wisconsin. The featured aircraft are from Kansas State University and the University of North Dakota. On track to exceed 1,300 flight hours, the Top Hawk Skyhawks have been utilized for a variety of efforts. All four Top Hawk partner schools participated in the National Intercollegiate Flying Association’s (NIFA) National Safety and Flight Evaluation Conference (SAFECON) Competition in May where the University of North Dakota Team took second place. University of North Dakota has taken its Skyhawk to five air shows and fly-ins, including the Women’s Air Race Classic in June. The university will be participating in the Fargo Air Show at the end of July. Kansas State University has showcased its aircraft at several university events including an open house in Salina as well as the campus jobs fair. They also plan to participate in the Kansas City Air Show in August at the Wheeler Downtown Airport (KMKC). Liberty University’s Cessna Skyhawk recently embarked on a 34-stop, 8,500-mile tour to 32 different flight schools across the U.S.
Embry-Riddle Aeronautical University participated in several events with their Top Hawk Skyhawk to include AOPA Homecoming in June, the Women’s Air Race Classic, Aviation Career Education (ACE) Academy camp in Atlanta, Georgia, and EAA Young Eagle events. “Training the next generation of pilots remains critical to the success of business and general aviation, and Textron Aviation is committed to providing the resources to support that effort,” said May. The Skyhawk is the world standard for pilot training and is renowned for offering the best combination of modern features, including the G1000 avionics system, and proven dependability. More Skyhawks have been delivered to customers around the world than any other type of aircraft, with more than 48,000 in service since 1955. Website: For more information on Top Hawk, please visit http://cessna.txtav.com/tophawk. Textron Aviation Inc. is the leading general aviation authority and home to the iconic Beechcraft, Cessna and Hawker brands, which account for more than half of all general aviation aircraft flying. The Textron Aviation companies include Cessna Aircraft Company and Beechcraft Corporation, bringing together decades of unmatched experience in designing, building and supporting airplanes. It provides the most versatile and comprehensive general aviation product portfolio in the world through five principal lines of business: business jets, general aviation and special mission turboprop aircraft, high performance piston aircraft, military trainer and defense aircraft, and a complete global customer service organization. Its broad range of products include such best-selling aircraft as Citation and Hawker business jets, King Air and Caravan turboprops and T-6 military trainer aircraft, all of which are backed by the industry’s largest global service network. For more information, visit txtav.com. Certain statements in this press release are forward-looking statements which may project revenues or describe strategies, goals, outlook or other non-historical matters; these statements speak only as of the date on which they are made, and we undertake no obligation to update or revise any forward-looking statements. These statements are subject to known and unknown risks, uncertainties, and other factors that may cause our actual results to differ materially from those expressed or implied by such forward-looking statements, including, but not limited to, the efficacy of research and development investments to develop new products or unanticipated expenses in connection with the launching of significant new products or programs; the timing of our new product launches or certifications of our new aircraft products; our ability to keep pace with our competitors in the introduction of new products and upgrades with features and technologies desired by our customers; changes in government regulations or policies on the export and import of our products; volatility in the global economy or changes in worldwide political conditions that adversely impact demand for our products; performance issues with key suppliers or subcontractors; and continued demand softness or volatility in the markets in which we do business. This entry was posted in Airlines, Airports, Flights, Transportation, Travel, Travel Management, Travel Marketing and tagged Cessna Aircraft Company, Doug May, the Experimental Aircraft Association AirVenture, Top Hawk-branded Cessna Skyhawk aircraft. Bookmark the permalink.